1st thing THE DVD I BOUGHT THE COVER OF IT IS DESIGNED DIFFERENT BLUE, SAME MICKEY PHOTO WITH SISKEL & EBERT QUOTE ON THE BOTTOM I have always liked this film. I had not seen it in years. It still made me laugh Of course, they ran it into the ground when they kept making sequels that just did NOT work. My rating is for the film. I am NOT a fan of Travolta's. You see him dancing again & his love of filming were put into the film Good soundtrack to the film, a couple of Beach Boys songs among them. This is a cheap DVD. Where is the wide screen people? Full screen, that is it. BE CAREFUL WHEN READING PRELOADED INFORMATION ON WEBSITES ABOUT THIS DVD. I HAVE SEEN WHERE THIS DVD SHOWS IT HAS BOTH WIDE & FULL SCREEN. INCORRECT. NO extras at all, no chapter search list. And, of course the other negative. Cheap DVD has 1 of these HORRIBLE plastic DVD cases with the intentional holes in them. HORRIBLE, TERRIBLE & CHEAP. Your DVD can be damaged.. If you like the film go ahead & purchase the DVD. But keep in mind all I say above, cheap, NO WIDE SCREEN, extras, & your DVD can be damaged. 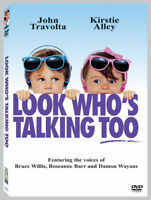 Look who's Talking featuring John Travolta and Kirstie Alley and Bruce Willis as the voice of the son Mikey(voiced by Willis) to Molly(played by Alley)as James(played by Travolta) becomes the ''adoptive father'' through the scenes following the birth where he is present. As the first picture of three(two later released) this answers that comedic question of "what do babies think?" With the film being shot on location up north in Canada and New York areas the director had many excellent shots that came together to create, in my opinion a masterpiece. I probably have seen this movie 8-12 times and still laugh at the comments from Mikey(voice of Willis). All in all I would give the overall movie a 5 star rating for originality and just being a great comedy. I love this movie since I was a girl, now I am marry and my children enjoy about it . Love it,love it, thank you!!! Mollie is an accountant who has been having an affair with one of her clients, Albert, who happens to be married. When she becomes pregnant by him, she feels that he will be there always for her and the new baby. But when she gives birth, he breaks it off and Mollie is left to raise a new baby all by herself. She also is searching for the perfect father for her new son, Mikey. She meets James, a swift cab driver, who seems to be a perfect match with her and Mikey. But when Albert comes to her, who will Mollie choose. This is such a great movie, I highly recommend it if you get the chance to see it, it's a great classic.